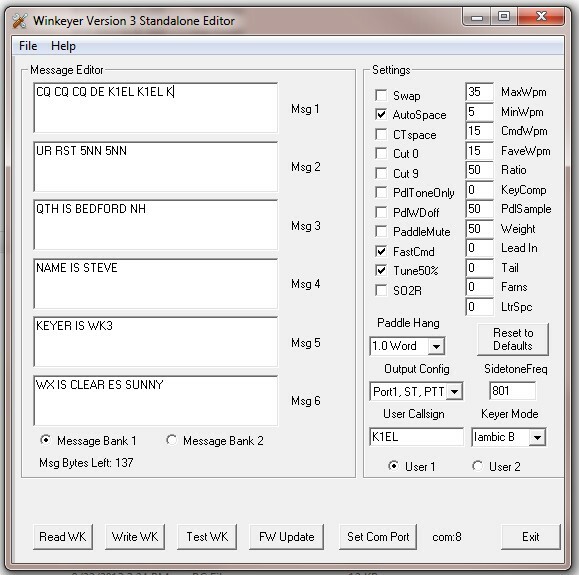 WK3tools is an accessory software application for keyers based upon the Winkey2 IC. This family of WKs can run in standalone mode, not connected to a host PC. Commands and messages can be entered on the paddles but this can be tedious and prone to error. WK3tools allows you to configure all the settings quickly and easily via an intuitive MS Windows application. Just connect your WK3 keyer to a PC comm port. You can read current settings, modify them, and write them back. In addition you can can save settings to a disk file to maintain a set of configurations that can be loaded depending on operating scenario. Message loading is a breeze, even embedded commands can be included easily and then tested.